The year 2018 marks the 250th anniversary of the birth of modern circus in England, and will feature a variety of projects and events throughout the UK; including exhibitions, talks, and film screenings. 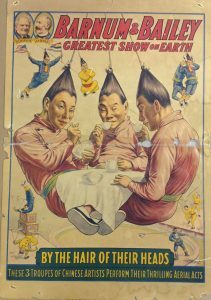 In honour of this anniversary, the National Fairground and Circus Archive and the School of East Asian Studies at the University of Sheffield are working together to research and commemorate East Asian elements within the British circus. The first element of this joint project is a Sheffield Undergraduate Research Experience scoping study, conducted by final year Bachelor of Arts in Chinese Studies and History student Nicola Unwin, and supervised by Dr Mark Pendleton and Dr Marjorie Dryburgh. Here is what Nicola has been finding as she explores the NFCA collections. My research sets out to analyse East Asian culture as a trend in British society, and how that itself is encapsulated within the circus ring. There are many that view the circus merely as a spectacle; on the contrary, it is a reflection of society. During the twentieth century, the circus was one of the most popular forms of mass entertainment. The circus welcomed all guests with no class bias, and the circus was just as warmly received across wide segments of British society. Due to this, the circus is a perfect platform from which to build an analysis of popular culture and trends in any decade. For example, during the late twentieth century, as we entered the comic book phase of popular culture, Spiderman became a popular feature of many circus rings. The Western obsession with all things Asian, particularly Chinese artefacts, dates back as far as the Renaissance period. From there, interest only amplified. The early twentieth century saw a resurgence of chinoiserie, reflected in clothing, hairstyles, and even furniture which featured classic Chinese motifs. Of course the circus, home of all things mystical and different, could not resist the allure of the ‘Orient’. 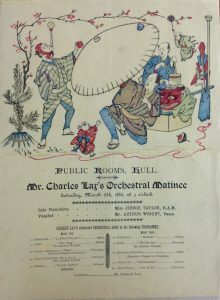 Many artists ‘from the orient’ performed acts associated in the popular imagination with traditional Chinese culture, such as hanging from the hair, hand balancing, and acrobatics. This fascination with Asia can also be found in acts such as Chung Ling Soo, a Chinese performer celebrated for being the world’s greatest magician. However, he was not actually Chinese. In fact, Will Robinson, an American man, recognising the popularity and allure of Chinese acts, took on the role of Chung Ling Soo. Robinson was not alone in taking on a persona either to enhance the perceived authenticity of their acts or to take commercial advantage of the interest in Asia. In fact, ‘China’s greatest foot juggler Chung Wong’, was a persona of a man named Billy Moxon. Chung Ling Soo, The World’s Greatest Magician! As time went by, as with many fads, the mysticism surrounding Asia began to fade, however, the popularity of Asian acts continued. In fact, many acts such as Lilly Yokoi began to be heralded more for their skill and talent, rather than their ethnicity. Born in New York in 1929 to acrobat parents who had migrated from Japan, Lilly Yokoi performed acrobatics on a bicycle. Unlike many ‘Oriental’ circus acts discovered during my research, Yokoi’s ethnicity is never focussed upon, and she was never exhibited as an oriental act. Yokoi did not bend to stereotypes and chose to wear a more typical circus show costume, rather than clichéd oriental robes. During the course of my research I have been forming links between the overarching historical narrative of the twentieth century, and the presence of oriental acts in the circus. Through discovering these links, you can develop a wider picture of attitudes towards East Asia throughout the century. 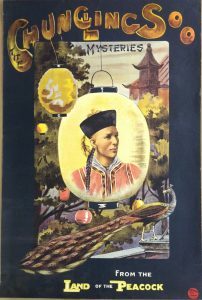 As my research continues I will look at specific historical events in Asia and analyse how certain events can affect the reception of Chinese acts within the British circus. For example, would the empathy felt towards Chinese citizens during the aftermath of the 1937 Nanjing massacre extend to the circus, causing the ratio of Chinese acts to rise, and that of Japanese drop? And eventually, venturing closer to our modern day world, questioning if it was Cold War tensions, or a rise in awareness of issues around race and ethnicity, that precipitated a break in the fascination with the ‘Orient’ in the circus.